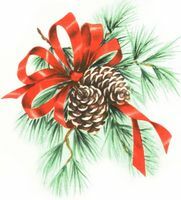 The simplicity of these easy pine cone ornaments is what makes them so appealing. Although you can leave the pine cones in their natural state, it’s nice to add a little glitz for Christmas with shiny bows and just a touch of gold paint. 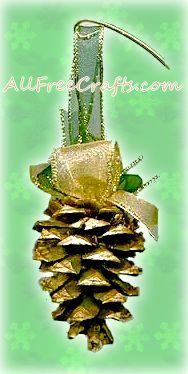 Very lightly spray your pine cone with gold paint. Allow the paint to dry. Tie a simple shoe lace bow using your widest ribbon. I used a single bow of two different colours and widths. Tie another bow with your narrow ribbon, creating a loop to use as a hanger. Glue the widest bow to the pine cone end, as you can see in the photo and, on top of this bow, glue the second smaller width bow with the loop extending out. That is all there is to making these ornaments. Be creative with spray paint colours and ribbons for some truly beautiful ornaments.